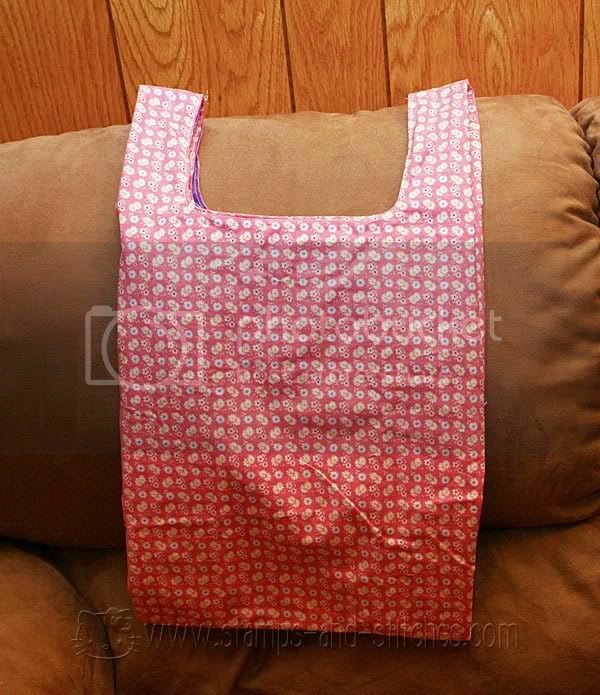 I've been wanting to make homemade grocery bags for a while so tonight, I made one. I used this instructable by Compwalla (shift click to open in a new window) which is probably the best one I've found for making a bag that looks a lot like a plastic grocery bag. I used a Target bag as my pattern. The fabric I used for the lining was a little heavier than I should have used-but most of my yardage is earmarked for a certain project or not big enough. I may try doing patchwork ones. 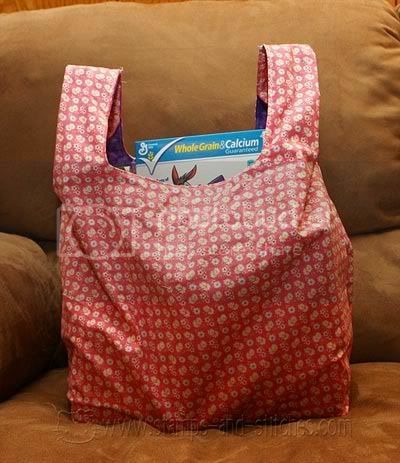 I also added a pocket so that the bag can be folded up and slipped in the pocket. Because of the thicker lining it's a challenge to get it in there though, but the pocket can also be used as a regular pocket. I also did a french seam at the bottom but I probably won't do that next time-my machine had a little trouble with it. I also wanted to thank everyone for the nice comments about my Father-in-Law (and poor pitiful me) and wanted to update. He was in the hospital for about 5 days and then was transferred to a rehabilitation facility. He should be in there for another week or so, depending on his progress. The stroke was mild and the main things it affected were his speech and swallowing. He's eating solid foods now (but can't handle liquids so all of his drinks have to be thick) and is speaking much better. They are also working on his balance and walking-he's having some trouble with those too. He's joking around and flirting with the nurses, so that's a good sign. He's complaining about doing nothing though, so I can't even imagine how hard it will be on my Mother-in-Law once he is home and in the house all day wanting to do some work and not being able to. So anyway, things are definitely improving. We've had some rain the past couple of days too, so my husband is home for a few days (but still really busy during the day, but at least not working until late into the night right now). So anyway, thanks. Thanks for the update Gale!! Good to hear he is flirting with the nurses...always a good sign! :) I love your grocery bag!! 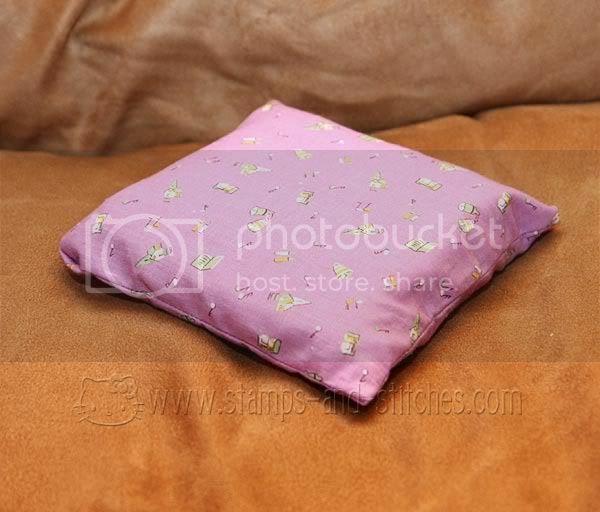 What a great idea to make a pocket for it!! Glad to hear things are lookign up for you and for your Father-in-law. Love the bag. I need to have my Mom make me some of those. I have the ones you buy but they don't wash very well and I seem to be washing mine a lot. That bag is so cool! I love how it folds up in a pouch! Glad to hear your FIL is doing better....hang in there! Happy to hear your FIL is on the mend. Love that bag. I keep meaning to make some. So good to hear that your FIL is improving! I love the grocery bag. I have reusable ones too but mine are not cute like yours. It looks very roomy and it's so cool that it folds into the pocket!